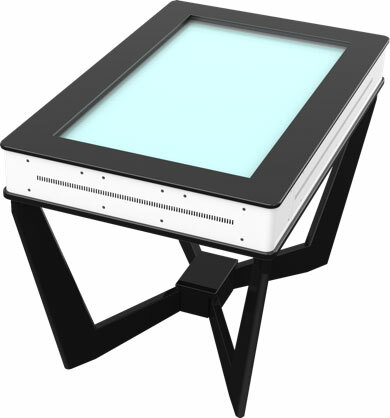 GestureTek’s award-winning Illuminate Multi-Touch Table is a user-friendly surface computing technology offered in nearly any shape or size to suit any requirement. The turnkey multi-touch screen display stands 36" high, with a 30, 40 or 55” diagonal gesture-controlled screen, powerful multi-touch computer, projector, camera and speakers. Control is via a multi-point or multi-touch interface. 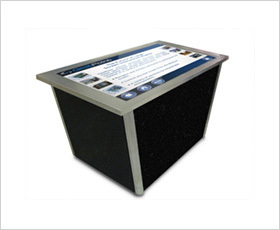 GestureTek’s full library of GestureFX special effects applications can be included in the multi-touch display table. The GestTable 42" LCD Multi-Touch system is another popular multi-touch option for GestureTek customers. GestDisplay comes as a turnkey table or as shallow panels that can be hung on the wall or built into custom furniture designs. Systems are modular and can be connected together for connected interactivity across multiple screens. Want something really unique? Let multi-touch technology transform your ordinary bar, counter, wall or retail window into an interactive multi-touch computing surface. 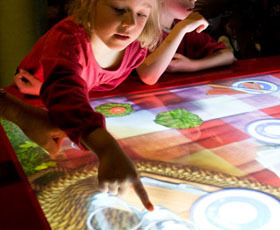 GestureTek’s multi-touch technology lets people use hand and finger gestures to interact with multi-media content, access corporate information, play games, create special effects, manipulate art and photographs, even view advertising, in a truly unique and compelling way. 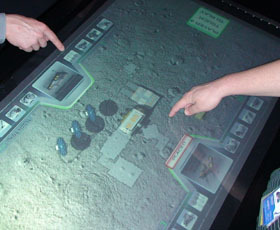 Using patented, ‘Minority-Report’-style hand tracking and gesture recognition sofware that has been proven in commercial use for more than three years, GestureTek is a pioneer in delivering custom interactive multitouch tables and surface computer displays. 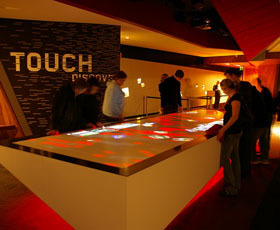 Installations have included a dynamic interactive map and way-finding system for Samsung's retail showroom in New York’s Time Warner building, the world’s largest interactive multi-touch surface computing table in Melbourne’s Eureka Tower, a space-age multi-touch interactive table game for NASA and an engaging entertainment-style interactive entertainment table for patrons of Alice Fazooli’s restaurant in Toronto. GestureTek’s multi-touch technology has limitless applications for retail stores, stadiums, corporate lobbies and foyers, corporate board rooms, showrooms, presentation centers, nightclubs, restaurants, hotels, tourist attractions, tradeshows, interactive advertising, and other public spaces where interactive kiosk-style multimedia is desired. We’ve even worked with the military to integrate our exciting technology into their facilities. Learn more about market-leading features our multi-touch surface computing platform. Learn more about GestureTek's LCD multi-touch option. Learn more about GestureTek’s multi-touch display panels, screens, windows and other vertical multi-touch surfaces. Looking for an immersive solution where the user appears in your interactive display, ad or digital sign? See GestureTek’s ScreenXtreme. GestureTek Systems Inc. is proud to announce that it is now offering 4K pixel displays with its multi-touch, multi-user tables and displays. The addition of 4K display technology to the GestureTek Illuminate Series of multi-touch tables expands GestureTek's leadership in the multi-touch table industry by combining stunning 4K image clarity with a multi-touch experience. It offers a best-in-class solution for professionals who seek to collaborate using a large viewing area and the highest image resolution. GestureTek's 4K Multi-Touch Table is ideal for education facilities, public display applications and any interactive digital signage designed to promote customer engagement. GestureTek already offers the latest and most advanced multi-touch tables that can have anything from 6 touch points to 32 touch points and we can build custom sizes up to 84 inch displays. The GestureTek 4K Pixel Multi-Touch Table extends this offering further by providing a large-size multi-touch solution with unmatched pixel density. - A multi-touch, multi-user experience: GestureTek's multi-touch tables offer 6 to 32 touch points, making it easy for multiple users to collaborate and interact at the same time. Our displays recognize the full range of common touch gestures including tapping, scrolling, pinching and rotating. - Custom Display Sizes: GestureTek turnkey 4K multi-touch tables can be custom built to be from 32 inch displays to 84 inch displays. - 4K LCD Display: With a 4K resolution, GestureTek Multi-Touch Tables provides four times the pixels of a standard HD display for amazing clarity. - Pivot Table: GestureTek's Multi-Touch Table can be custom built to be used as a regular flat horizontal table or have a pivot feature to orientate the table so it can be either at a 45 degree angle or in a vertical display position. This is great for trade shows and retail way finding solutions, providing the flexibility needed for a wide range of applications.